Deep within Sebastian’s vivid imagination, international spy Foxfire is tasked with her most difficult mission yet: to find and capture the Devil himself. 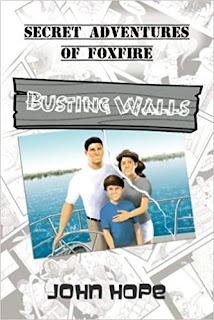 Outside Sebastian’s solitary comic book–drawing bouts, the mystery-loving twelve-year-old helps his friends construct a secret tree fort using building supplies from an abandoned neighborhood shed, while at home he struggles to find common ground with his stepdad after his mom has left them following a car accident. Distant as Sebastian’s reality is from his creative musings, Foxfire’s secret adventures eventually converge with Sebastian’s personal struggles.